Intro: I read most major works on the book of Proverbs for my doctoral coursework. So I try to make myself aware of new material on Proverbs. 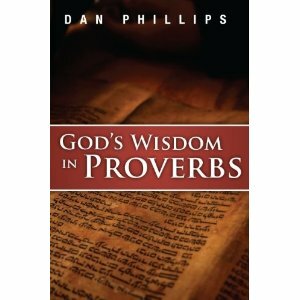 Kress Biblical Resources recently released a new book by Dan Phillips entitled, God’s Wisdom in Proverbs. Phillips is a pastor and blogger (see here). I first heard of him via his contributions to the Pyromaniacs blog. His writing is engaging and often humorous. It’s unique in the sense that I almost get the feeling that I’m conversing with him as I read. There is a give-and-take feel that is enjoyable. This new book is no different in style, although it is particularly rich theologically and pastorally, which is a refreshing take on a book that many take to be full or moralistic maxims. Summary: The main thrust of God’s Wisdom in Proverbs is that the biblical book is not primarily about wisdom in general, but wisdom rooted in the revelation of God’s word; i.e., a wisdom that is defined as the skill for living in the fear of Yahweh. The first two chapters deal with interpretative issues, authorship, and design. Then Phillips spends a great deal defining “the fear of Yahweh” and “wisdom” in both the context of Proverbs and God’s unfolding revelation. These early chapters are focused on the sections of Proverbs that are most familiar: 1:1-7, 2:1-5, and 3:1-12. Then Phillips has three lengthy chapters on big topics in Proverbs like godly relationships, marriage, and child-training. The book ends with four appendices that provide further material—FAQ’s, as it were—on common mistakes and questions that Proverbs addresses, as well as some suggestions for teaching or preaching from the book. As someone who has thought a lot about how best to preach from Proverbs, I found this section particularly helpful. I was a little confused as I began reading this book because I was expecting something entirely different. The title suggests that the book is a commentary. It is not a commentary. It begins like one (with introductory topics on the front end) and ends like one (with appendices on a few ancillary issues). So my initial comments in the margins of the book are the critical “this-is-not-how-to-write-a-commentary” type. But as I continued to read I was corrected, and then I was more and more refreshed by Phillips’ writing, particularly in the chapters on marriage and child rearing. Indeed, I think Phillips has written the best thematic study on training children in Proverbs that I have read. No other commentary or book goes into the depth that he does on this topic, which includes a helpful biblical theological perspective. I was greatly encouraged by it and I hope to read that section again with my wife. A little criticism: I have a few points of critical interaction. First, if someone is interested in delving into the issues surrounding Solomonic authorship I would suggest a few other resources. This is not to say that Phillips’ arguments are invalid, only that he doesn’t deal with all the historical and grammatical evidence against Solomonic authorship (I obviously agree that Solomon wrote the majority of the book). For instance, there is no mention of the Wisdom of Amenemope and how it relates to Proverbs 22:17-24:22, which is a huge issue in the authorship of Proverbs debate. One might think that this discussion has no place in a book like the one Phillips is writing, but since he devotes 11 pages at the beginning of the book to the issue of authorship in addition to an entire appendix (20 more pages), I would say that a big issue like this is worth treating (or at least referencing). He could easily point to Kenneth Kitchen’s article, “Proverbs and Wisdom Books in the Ancient Near East” (TB, 1977) or even Waltke’s section in his commentary to refute the critical view that says the Proverbs were adapted from Egyptian wisdom literature (which is patently false). Third, sometimes the organization of the various chapters is confusing. I would expect that in a book on Proverbs, for instance, the author to treat the material of a specific topic (such as marriage) within the book of Proverbs first before going to other books of the Bible to find material on the same topic. Phillips does this the other way around. In the end the reader arrives at the same point, just only by getting there via different avenues. Last, Phillips goes a little overboard on word studies. I grant that lexical analysis is needed, especially in Proverbs as every commentator is prone to point out. But I think that Phillips could communicate his points clearly without going into the definitions of so many words. The definitions help, 0f course, but I was more interested in how the words are used in various contexts. Conclusion: Dan Phillips and I are a like in a few ways. We’re both pastors. We’re both new to the Houston area. He’s bald and I’m balding. And we both love the book of Proverbs. On this last point I’m grateful that he has given us a fresh look at Proverbs with a pastoral perspective. He is a clever and witty writer, and the his points are clear. Although I have a few foibles with the book, it’s infinitely better than Longman’s How to Read Proverbs, and deserves a place on the shelf. I’m glad to have read it and I would certainly recommend it to others. It’s not a seminary-type book and I wouldn’t use it in the classroom at the M.Div. level, but I would in an undergrad setting.